Sad news, it looks like one of my favorite manga, The Promised Neverland, is ending after a relatively short time. Seen on this cover, it looks like Shonen Jump has announced that this will be the last of this series. The manga started in 2016 and after a slow start, gained massive popularity. The Promised Neverland has been a staple in my manga reading list for the majority of this year. This manga has picked up considerably for me once the initial plot twist, however, I’m not sure how much they could have dragged out the story. While the world is rich in details, Emma and Ray’s goals are within sight. 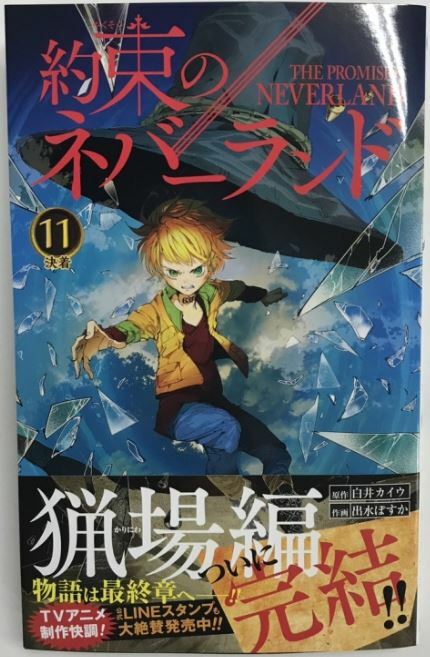 There are still huge unanswered questions regarding main characters in the story, but I have a feeling manga-ka Kaiu Shirai, will wrap up all the loose ends and give us the spectacular and satisfying finish we have been yearning for. While there is no exact date given, the end is near. Will Emma, Ray, and Norman succeed?